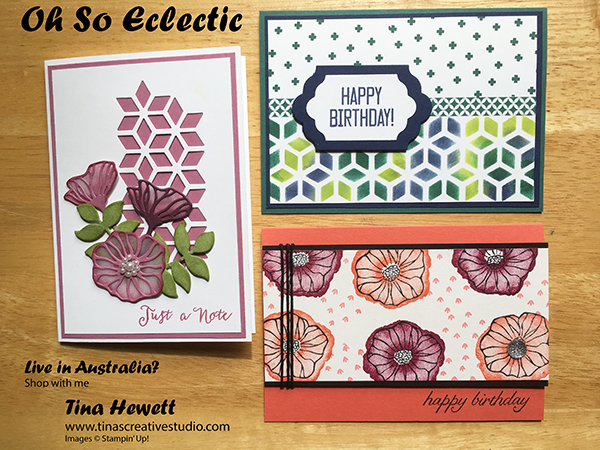 Tina's Creative Studio: Fun cards using the Oh So Eclectic bundle from Stampin' Up! Fun cards using the Oh So Eclectic bundle from Stampin' Up! Here is another class I ran in September, using the Oh So Eclectic bundle. I love the fact that you can create very different cards using the same stamp set and dies, plus a couple of other bits and pieces. For the blue/green card I created a stencil with the geometric die from the Eclectic Layers Thilits dies, which are part of the bundle. I used sponge daubers to add colour through the stencil. The top part of the card is not patterned paper, rather I created my own pattern using one of the stamps in the set. This would be suitable as a male birthday card. The floral Just a Note card uses the same die from the first card to create a geometric opening on the top layer. The flowers are die cut from cardstock, and are layered onto Vellum cardstock, which has been stamped with their matching stamp images. The last card is using the 2-step stamps in the set to create the flowers on a panel, and then one of the smaller stamps has been used to fill in some of the white space. Here are the supplies I used to create these cards. If you'd like to purchase any, just click on the image to be taken directly to my online shop.